Pasta is definitely a staple in our house, and it was something my mom cooked regularly when I was growing up. Thank goodness my brother and I were active bicycle racers growing up because we sure ate A LOT of carbs in our house! A typical pre (or post) bike race meal in our house was a huge bowl of pasta (often a recipe selection from a Marcella Hazan book), a loaf of bakery bread with lots of olive oil and balsamic vinegar, and a salad. 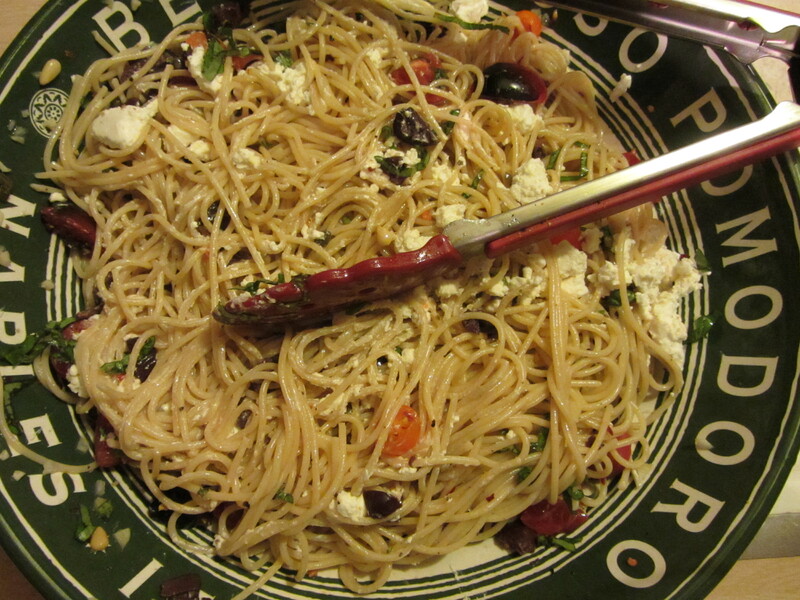 In the summer, antipasto pasta salad was on regular rotation for our Thursday night time trial (local bike race) nights. Due to our family’s frequent consumption of pasta, it became one of the first meals I was comfortable fixing for my family. One of my favorite pastas to make as a kid had a simple sauce of olive oil, garlic, salt, pepper, rosemary, tomatoes, a splash of balsamic vinegar, and some grated hard cheese. Pasta, in my mind, is comfort food, and a great plate of pasta is one of my very favorite things. In the 11th episode of Good Eats, Alton makes a simple pasta that uses the various ingredients you happen to have on-hand in your own pantry. To begin, he explains that the only way to properly cook pasta is in a very large volume of water. He recommends six quarts of water per pound of pasta, and of course, that the water be salted to the flavor of sea water. I have yet to try this cold water method of cooking pasta, though I did tell my brother about it and he told me he had great results. I’m sure many Italians are rolling over in their graves at the very thought of this new method of pasta cooking, but this Scottish/Irish girl is open to the idea and will be trying it the next time I cook pasta. Guess that means we have to have pasta again soon. Darn (sarcasm)! Back to the recipe, as featured in the episode. 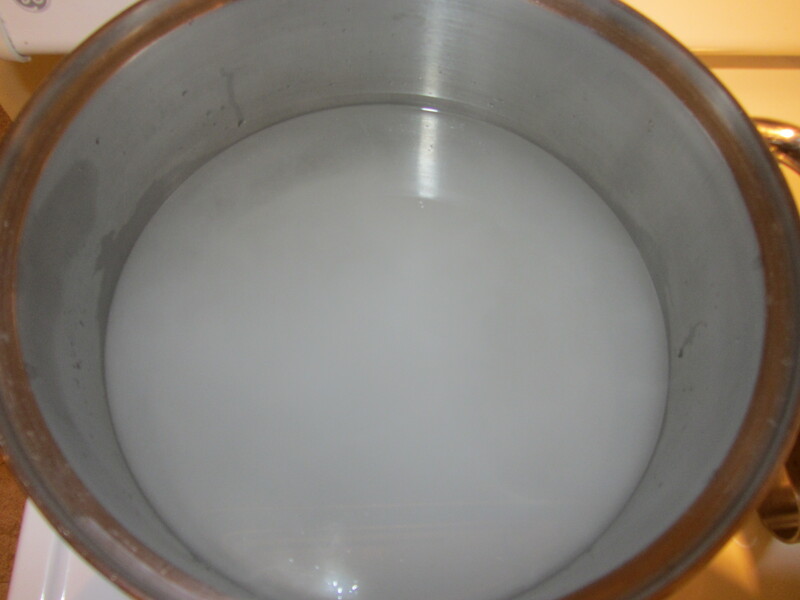 You bring a large pot of salted water to a boil and add your spaghetti, using tongs. Alton stresses that you need to fan the pasta out, rather than dropping it into the water in a large clump. I consider this to be somewhat intuitive. 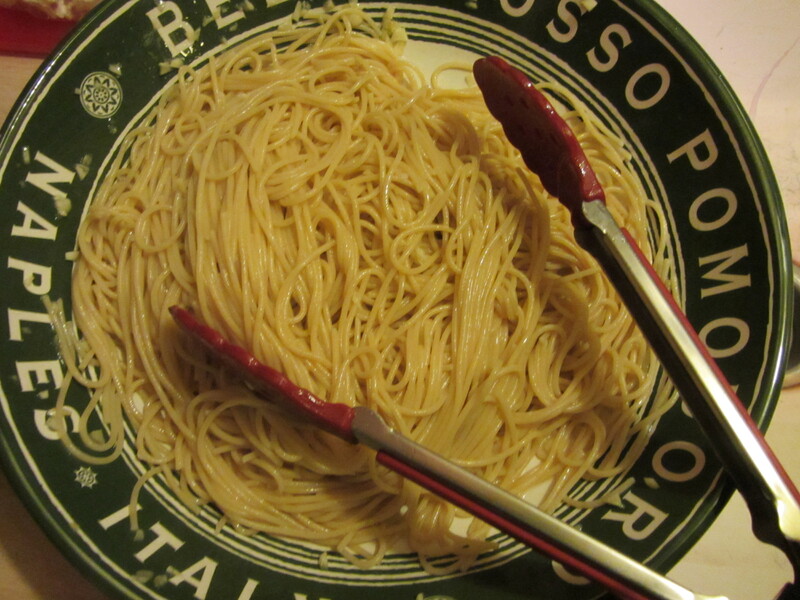 I have never before used tongs when cooking pasta, as my tool of choice is the slotted spork, but I followed Alton’s recommendation and used the tongs. 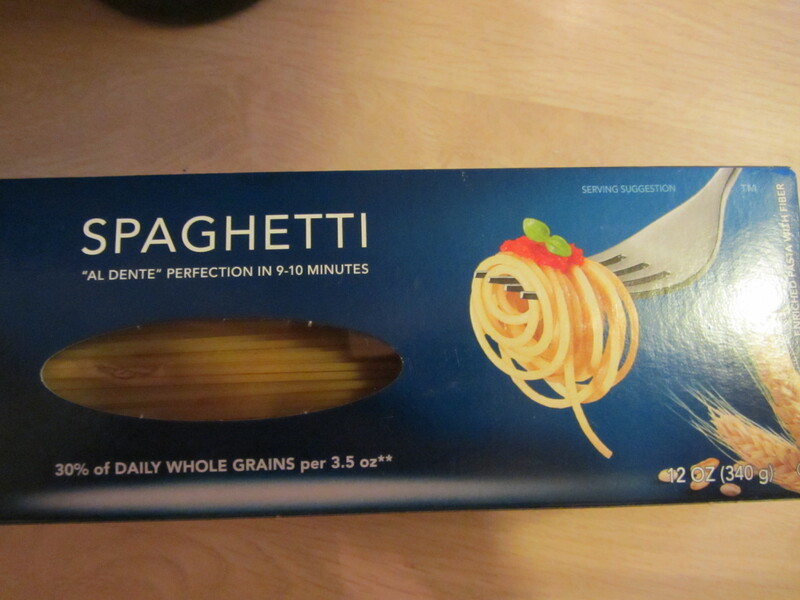 They were effective at separating the pasta strands in the water, but I found them to be more cumbersome than the spork. Alton tells you to cover the pot while the pasta cooks, which is something I never do, but I did it for this recipe. While the pasta cooks to al dente, you pour some good olive oil in the bottom of your serving bowl and add some finely minced garlic. 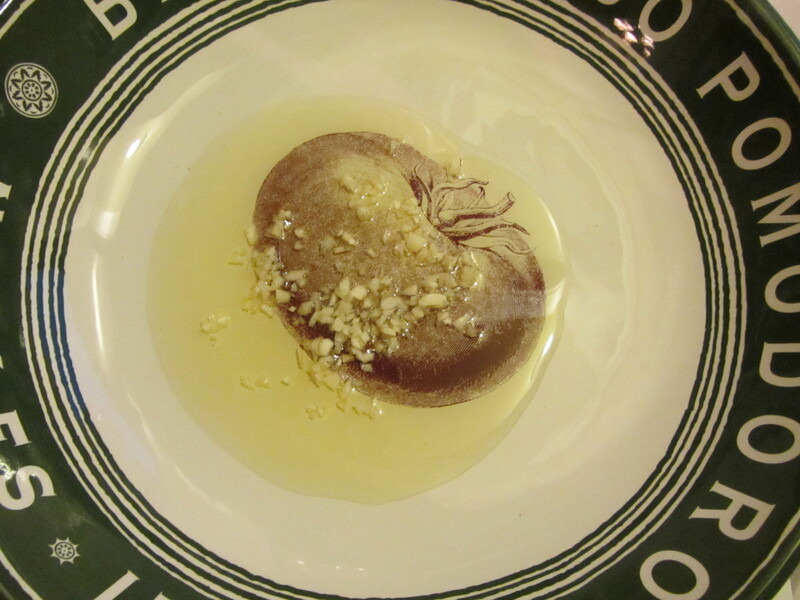 Olive oil and garlic in the serving bowl. 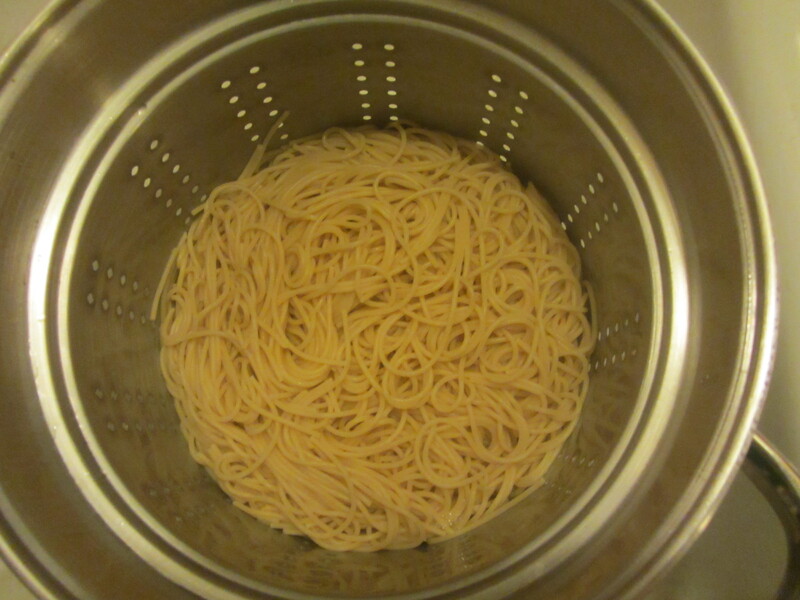 When the pasta is cooked, you toss the hot noodles with the garlic/oil mixture until evenly coated. Tossing the noodles with the garlic and olive oil. Alton says the noodles will cook the garlic enough to get rid of the strong raw garlic flavor. At this point, you add whatever pantry ingredients you choose to have. I opted for orange cherry tomatoes and black tomatoes from the garden (Deer ate all of our San Marzano tomatoes on the day of this recipe! 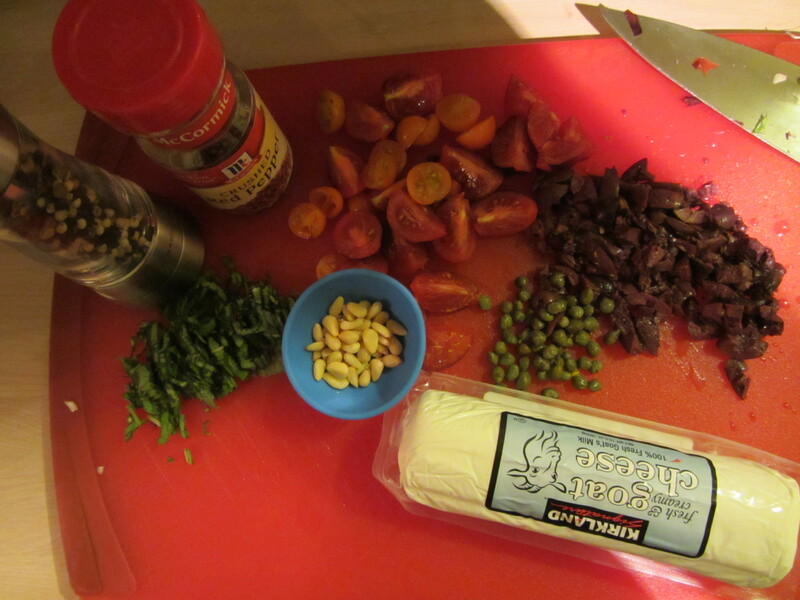 ), fresh basil, pine nuts, kalamata olives, capers, red pepper flakes, black pepper, and goat cheese. Black pepper, red pepper flakes, basil, pine nuts, capers, kalamata olives, black tomatoes, orange cherry tomatoes, and goat cheese. Final pasta with the pantry ingredients of choice. We thought this pasta was tasty, but not Earth-shattering, as it is not unlike the pastas I will throw together on a regular basis. We did find that a relatively strong flavor of garlic remained, but we love garlic, so we were okay with it. Of the recipes I have done thus far from Good Eats, I would say this was the least novel, though still good.